Several years back I went to Australia to teach classes and found out a very interesting part of Australian holidays. Did you know that Mother’s Day is as big as Christmas in Australia? All other traditions take a back seat to dear ole “mum”. Isn’t that a lovely thought? Being a mom and having a mom sure makes me appreciate the idea that moms are high priority. 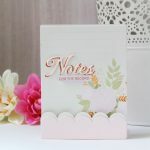 With that said and Mother’s Day less than a month away, I thought I would share with you some cards you can create for your Mom from my “Quite Contrary” line by Spellbinders. 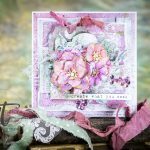 Some of you know that on my personal blog on Mondays, I showcase a beginner, intermediate and advanced card/art piece/craft/diy item. So I thought I would showcase those three cards here today. 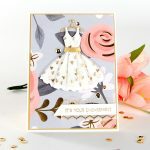 It’s my hope that if you are just joining us at Spellbinders® and are starting to dabble in art, you will take a stab at creating one of these cards. For those of you who are ready to move on to something more detailed, I have something to offer you too! The first card is the simplest of the three and it features the die and stamp set in black ink on white paper. The polka dots are a pencil eraser dipped in the black ink. This card adds a little more detail and color. It also showcases the sentiment being used as a background. I added a striped print to contrast the background. Ribbon and flowers were added to highlight the swan. Lastly, and my favorite style, is the more layered look. I used watercolor paints to embellish the flower and swan. Ribbon, a vintage pipe cleaner, decorative pins and millinery flowers completed the look. I really don’t like flat cards so I almost always use foam dots to raise the die-cuts up. So there you have it. Does it make you want to start making? What’s holding you back?